the Chu Cu guy seems alot more tougher..
Altair is a tactician and a hero. he is the best assassin. he even got a sword and armor with his name. As I told you on Skype, Its hard to compare since we are just told Altair is this great assassin, but we don't know what he did to get to it (Ignoring the stuff from the first game), where as Cu has this epic list of events to him. So, I am forced to compare Altair's events of the first game to Cu's events, which easily lets me pick Cu. But since Cu Chulainn has Gae Bolg, we can always go LOLGAEBOLG. It all depends on whether Altair can sneak up on Cu Chulainn and assassinate him or whether Cu Chulainn's survivalist instincts alerts him to Altairs presence before it's too late. In a straight up brawl, Altair is dying. No question. Thats true, I was under the assumption both of them knew of the other's existence and knew they were after each other's throats. I would expect Cu to be on guard if he knew an assassin was after him, which is enough to survive the initial stealth attack by Altair (Unless he did something really crazy). Altair could stalk the man for days and he can sneak up on a guarded person. So what I stated in my earlier post was in fact with consideration to both knowing of each other's existence and abilities. My point was that I had reconsidered my original position. Altair does have the advantage in stealth, but that also depends on where Cu is. A lot of the times, being a figure of Irish Mythology during Medieval times, means he was typically in wide-open areas, as a constant traveler, which effectively removes the "stealth" option (If I remember this correctly. I haven't read these stories in many, many years). Altair happens to be from Pre-Medieval to Medieval times, albeit in the Middle East and not Europe, so he's well aware of how to be stealthy in this situation. He will not openly engage him in open combat, but the opportunities will arise when he can get near the man. I do not believe Cu was a complete loner living in caves, never coming across strangers. I say Cu Chulainn must become aware Altair before the "first jump" when Altair closes in on him. 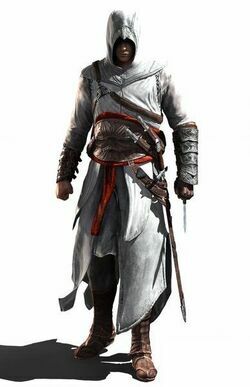 Altair is a master assassin and will not fail in killing if he gets his "first jump" in. I was not trying to say Cu lived alone in caves, my point was typically they were on the move - However it doesn't matter because I reviewed the stories and Cu wasn't the nomadic type, that I thought. Unless Altair screws up badly, he should not be seen by Cu before he makes his move. Cu has to be able to dodge the first strike or block it, then victory will be his (Unless Altair manages to get away, which could be possible, but then it just repeats). Besides, you also have to consider Cu's "hero light" (If I got the name right), that means Altair has to cut Cu's sword arm off before he can kill him properly - I doubt this is something Altair will know before going into battle with Cu, since its something that only happened upon the event that resulted in Cu's death. So that alone could be enough for Cu to survive Altair's first strike, if he was completely unaware of Altair's attack, and counter-attack properly. what is this hero light? sounds like a game changer here. Its what Cù used to cut of Lugaid's hand when he walked to him to cut of his head. Yep, didn't understand in the slightest. He used some sort of magic with his head cut off? ... no, Lugaid had 3 magical spears made foretold to kill kings, his chariot driver, his horse and Cù. Driver and horse was killed, but Cù was only mortally wounded. When a raven landed on Cù Lugaid thought it was okay to go and cut off his head, since he was dead. Since Cù was so fierce that no one dares approach him while he was alive. But when he walked up to Cù to cut of his head, Hero light activates and Cù cuts of his hand. 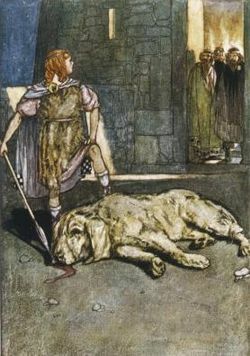 "Lugaid approaches and cuts off his head, but as he does so the "hero-light" burns around Cú Chulainn and his sword falls from his hand and cuts Lugaid's hand off." This kinda of says his head was cut off, and the hero light was some sort of insane luck guiding the sword.